Ready to apply funding from EstBAN? Interested in funding and exposure for your startup? You have a possibility to apply to become one of the top startups in Estonia! Once again, up to €250 000 will be invested into one company in Spring 2019! The application round for startups for Nordic Angel Program Batch 3 is now closed. Keep an eye out for the news and batch 4 applications. You can not receive Nordic Angel Program investment at pre-money valuation higher than €3M. Team working in Estonia or in close region, company registered in Estonia or close region, Estonian founders, participated Estonian accelerator or incubator program. Get an investment of up to €250 000 for developing your business. Increase the visibility of your startup to domestic and foreign investors by being listed among the best of early-stage startups in Estonia. 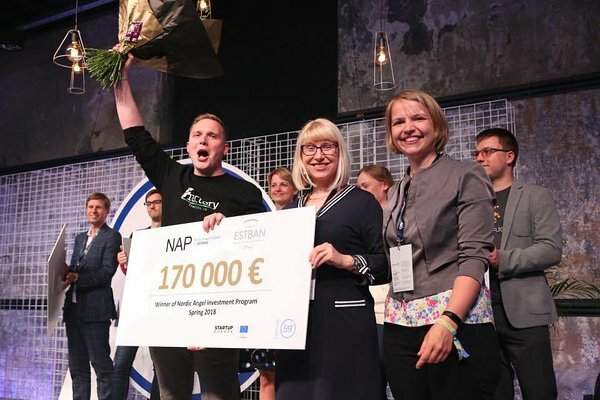 Get chosen to pitch your startup on the main stage of the biggest startup conference in Estonia - Latitude59 on May 16-17, 2019! Get business angels from the New Nordics to invest in your company and widen your potential market! Angel investors tend to open a lot of new doors! Nordic Angel Program Final Pitch is organized with leading Startup Events! The selection of the winner is a dedicated process - the applying startups will be evaluated by the investors in group sessions to select the TOP15, TOP4 and the winner! Final Pitching on the stage of Latitude59 on May 17, 2019 and announcing the startup receiving the syndicate investment from Nordic Angel Program by EstBAN angel investors. The application round for Batch 3 is open until 11.03.2019!